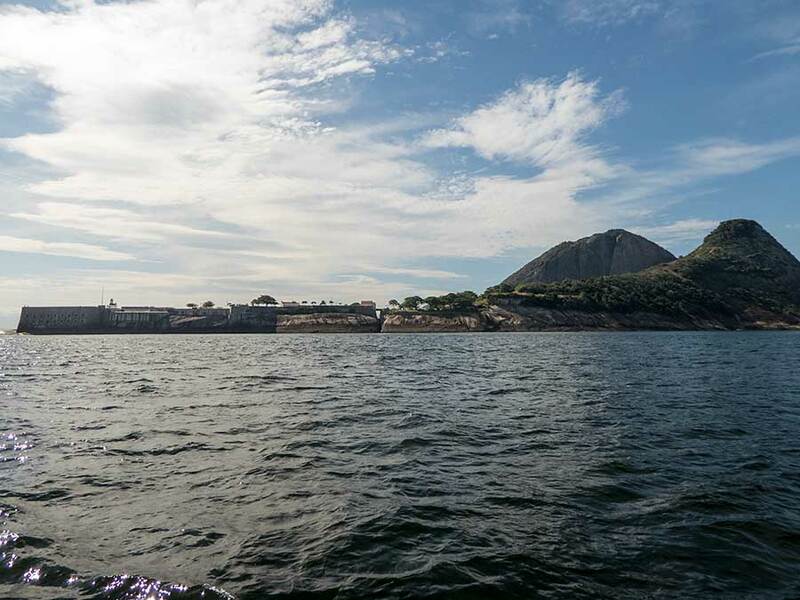 While in Urca (Rio) we picked up colds so we needed to rest up from all the Rio partying and head for Niteroi, just a few miles across Guanabara bay. We returned to the familiar and very comfortable surroundings of the Clube Naval Charitas where we had stayed in 2013. Once again we met up with local resident and circumnavigator Susy, who likes to help visiting cruisers. It's an ideal place to relax and prepare for onward passage. From Rio the coastline runs east for about 60 miles and then turns to the north at Cabo Frio (Cape Cold). 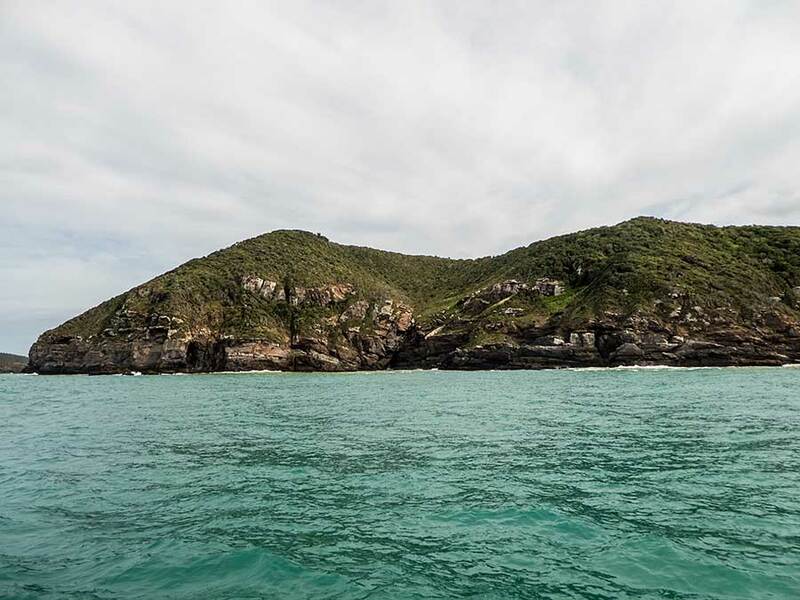 Cabo Frio is so named because deep sea currents coming up from the Antarctic rise to the surface there. For Brazilian sailors who learn their skills along the coastlines of Sao Paulo and Rio de Janeiro it represents a challenge, perhaps like getting to the Scilly isles from Dartmouth used to be for Paul's father: if the wind conditions are unfavorable your long-planned holiday cruise is thwarted. After 3 days at CNC the weather forecast was fairly benign so we dropped our moorings and ventured out of the entrance to Guanabara Bay. The winds were light and from astern so we hoisted the gennaker. It had hardly been up a few minutes when we were getting gusts of perhaps 20 knots and behaving very erratically so down it came again! We sailed for a while but then had to motor-sail our way east avoiding oil rigs, islands and fishing boats. 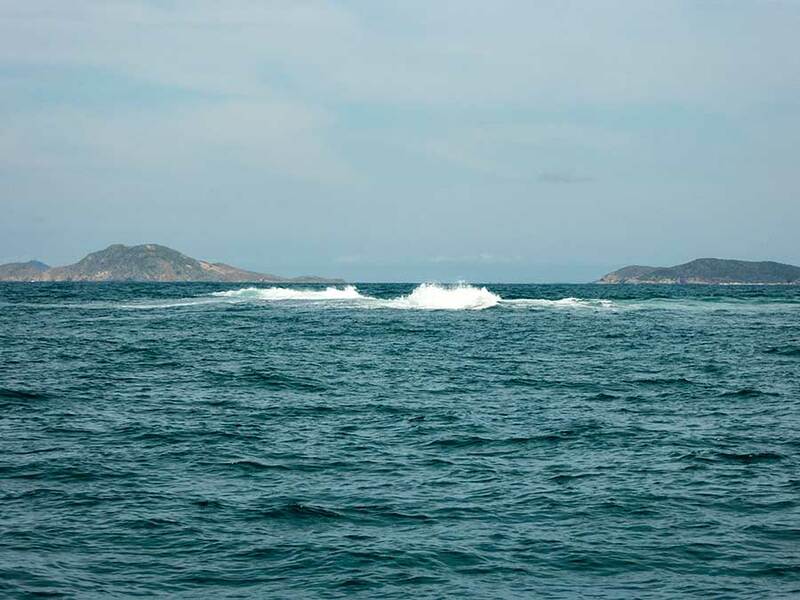 About half-way to Cabo Frio a 1.5 knot west-going current slowed our progress but by dawn the following morning we were around the cape and sailing through the small offshore islands towards Cape Buzios. Some of those small offshore islands are very small! Cabo Frio is reputed to be a good fishing spot and so it was for us. Paul caught another little tuna and made a reasonable job of filleting it (having practised on the previous one). It's one thing to catch a fish but another to do it the justice of preparing it well for cooking! 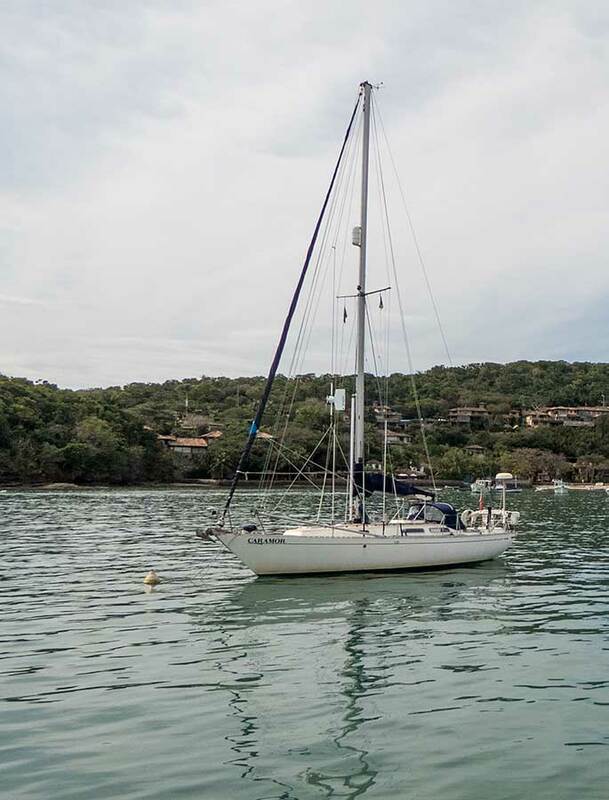 By mid-morning we were in Buzios, looking for a suitable spot to anchor. Pierre, a member of the yacht club, approached us by dinghy and helped us pick up a mooring. It's always nice to have such a welcome. We were also amazed to see two other foreign cruising yachts at anchor: one South African and the other Belgian. Since returning to Brazil we've come across few other foreign cruisers: a Mexican family in Ubatuba, Harvey in Angra, a Turkish yacht in Urca and an American in Niteroi. The best was yet to come. For the last 3 months we've been corresponding with Kath and Franco on s/y Caramor. They also blog on Mailasail and have been making their way down the coast from Salvador. We hoped to meet up at some point but there was always the chance we'd pass at sea. They arrived the following morning in Buzios. The other foreign yachts must have been amazed to see two British yachts in one place, so few come to Brazil these days. We had a lot of fun catching up with Kath and Franco. Caramor is a lovely sea-worthy boat that they restored for blue water sailing and then set off last year. We enjoyed sharing our experiences of restoring Lynn Rival and sailing in Brazil with them. But all good things come to an end and the wind waits for no one. Southerlies arrived on Saturday evening and it was time for us to continue north. Rachel was still stuggling to fight off her cold so we delayed leaving until Sunday morning, after the cold front - and hopefully most of the rain - had passed over. This next passage would take us around Cabo Sao Tome and we were hoping the southerlies would carry us some 200 miles north to Vitoria. Cabo Sao Tome is renowned for being difficult because there is a bank of shallows extending well out to sea. Not only is there a south going current to contend with along this coast but with southerly winds the seas can be very nasty off the cape. At the same time there's a large offshore oil field, forcing coastal shipping to concentrate on a narrow channel of deeper water as well as generating all manner of service vessels. And, of course, there are usually fishermen, whose unpredictable movements are always entertaining. It took us some time to unravel our mooring lines and get free but once out of the bay we sailed comfortably downwind, using our full main and genoa, goosewinged, in moderate southerlies. By the evening it was raining a lot and we approached Cabo Sao Tome (16 miles offhore) expecting the swell to be high, but the wind had died and the seas were normal. The current against us was just half a knot. We motored around the cape, thanking the AIS for providing us with information about all the shipping and oil support vessels coming and going. And the fishermen seemed to be having a night off - apart from Paul who caught a Spanish Mackerel soon after dawn. The wind came and went on Monday but most of the time we had enough to make headway in light easterlies. Closer to the coast the winds tend to be more northerly so we were beating. By dawn on Tuesday we were approaching the entrance to Vitoria, dodging the many ships at anchor and support tugs charging around. Having been here before it was all quite familiar and we were soon through the commercial shipping lanes and approaching the yacht club. We anchored near the yacht club entrance, where the depths are greater than shown on the chart. After watching a couple of turtles - who were swimming around us quite happily feeding - we settled down to a few days of recovery before continuing north.